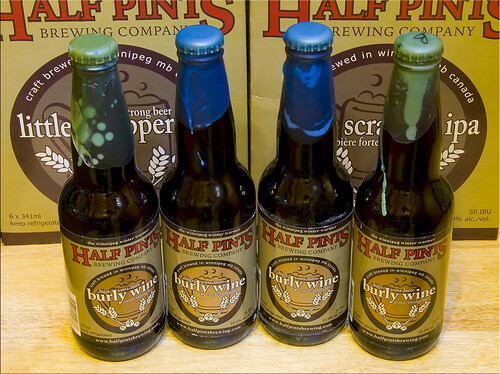 We dragged ourselves out of bed sometime around 7 this morning so that we could get out early enough to hit up the Half Pints Brewery for their annual batch of Burly Wine. It's not that we couldn't pick up the brew at our local liquor store later in the week, but by buying it directly from the brewery we got the chance to pick up some of the batch left over from last year. Unlike most beers, this one improves with ageing. They had a tasting room upstairs from the brewery shop where they were offering samples of this year's batch, last year's batch, and their Pothole Stout (which, very sadly, is no longer in production). After tasting each of them, I have decided that I am going to put aside all but one bottle from this year's batch for next Christmas. The bottles with the blue wax are from this year's batch. The green wax is from last year, and the one with the B on the cap is some of last year's batch that has been ageing over bourbon-soaked wood chips in an oak barrel for the past year. After we made our purchases and had sampled a few of the beers upstairs, David (the owner and brew master) wandered in and invited everyone to a tour of the brewery. I am familiar with breweries, and the brewing process, so there were no real surprises for me on that front. I enjoyed the tour none the less though because it was presented in the enthusiastic manner of somebody who obviously love his craft, showing off his favourite toys. On our way out we picked up a case of their Sweek Nikki Brown - another of their seasonal beers that is in limited supply.